"Juiblex witnessed the formation of the Abyss. He saw the obyriths emerge from their nether realm to pollute the Elemental Chaos, and he beheld the final struggle between Tharizdun and those most ancient of demons. Juiblex knows the true name of each obyrith. He has an intuitive understanding of each one’s ambitions. This knowledge makes Juiblex one of the few who comprehends the true purpose of the Abyss." "Undoubtedly, few denizens in the Abyss equal, in the horror they evoke or in the hideousness of their forms, the corrupt majesty of the Faceless Lord. In the gloom that enshrouds his realm, he holds court over the glistening masses, the twitching oozes he sires. Juiblex is deemed a lesser figure in abyssal hierarchy, judged Lord of Nothing by his peers. However, in my research, I have plumbed the foul mire to examine the full darkness that is this disturbing fiend. Juiblex is a power defined by incremental advances, a being whose wickedness flows slowly but inexorably toward an unspeakable end, which troubles even this writer." In addition to monster information, Schwalb's article gives an overview of the history, terrain and denizens of the Slime Pits of Shedaklah, where Zuggtmoy the Queen of Fungi rules the surface while the Faceless Lord broods in the tunnels below. All in all this download is quite useful to anyone who makes heavy use of demon lords or planes, which are so heavily integral to the Greyhawk campaign. Juiblex is also called He Who Slithers, the Unnameable One, Glistener, Indescribable Darkness, and Slick of the Foulest Humors. 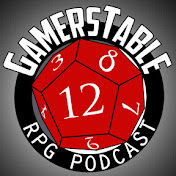 Speaking of humors, for those who don't have a subscription to D&D Insider, I wouldn't leave you all hanging with out some Juiblex love. Here is an old episode of the Graz'zt Show from 2009. "What makes a Villain? What events in a being's past brings it to the point of darkness? Is it a long slow decline or does it happen with one sudden choice? Can someone be born 'evil'? In the case of Sym'ar Al-bint Hura the answer is yes." Vile Roots is the first Greyhawk article by Leahcim the Learned for Canonfire! Follow the dark origin of Sym'ar (or one of her aliases), an all new villainess more than worthy of her evil heritage. You never know where or when Sym'ar will crop up or what schemes and revenges she will undertake. Enjoy! Araxo Tydan, black sheep step-son of the influential Count of Port Torvin is promised a swift voyage out of his family's hair. He and some like acquaintences wait to serve on their commissioned ship which still lays in dry dock. Until then they take a short tour across the bay on a merchant cog called the "Foam Runner" to the sleepy little village of Saltmarsh, part of the Kingdom of Keoland. Here, they follow the crowd that night to the only tavern in town for a night of rum and revelry. Word quickly reaches their ears about a nearby haunted house that blights the village. The house once belonged to an alchemist of ill repute who disappeared and has never been seen for nearly two decades. Since then ghosts and strange sounds have been witnessed by the fearful locals. The town drunk brags openly about once going in the back door of the place a couple years ago only to flee from the wailing ghosts within. Those of the Town Council express their desires for the place to be exorcised so that the land can be properly put to use for the village, yet no cleric has ever come brave enough to try this. Enter Brother Pickles. He is volunteered for the job by his fellow crew mates and after lengthy dilberation amongst everyone in the bar, two more people in the bar bravely step up for their own reasons to join an immediate mission to cleanse the house with the promise of a reward (and a cask of rum) in return for the clearing of the haunted house. Joining the band of four is Astenon of Burle, a spindly wizard who seeks the alchemical knowledge left behind and Redric a red-haired dockhand. The trip to the haunted house was quick and uneventful. The house is a two story high gabled affair overlooking the Saltmarsh bay with a crumbling fence around its yard and an invitingly open iron gate. Following the town drunk's story, the group headed for a rear patio entrance. Gaining entry and stepping in behind the lantern bearing Astenon, they were almost instantly assailed by a ghostly voice from above, threatening and laughing at the party as four of the six fled in fright back outside. Vic (too drunk to be scared) and Pickles (too curious where the sounds came from) unabashedly continued further inside, splitting the party temporarily until the rest caught their wits and returned. The pair searched around a few rooms and found barely more than a pile of books (no use to a sea-dog like Vic or an uneducated sea-preacher like Pickles). Vic did manage to find a small metal box hidden in a fireplace, and for his trouble he skewered the giant spider that lurked there. Back in the first room, Araxo and Semo discovered a trap door in the floor after following footprints in the dust. While this went on, the party further sundered as Astenon and Redric collected books from the ruined library. Some of these non-magical works were penned by Tenser and Nystul. Meanwhile, Araxo and his Olman compatriot plotted to reduce the number of people getting a cut of the reward and conned the pair of Keolanders into going down the trapdoor first. Once they were down there, the Holders barricaded the door so the two couldn't get back out and swiftly made to catch up with Vic and Pickles. Campaign note: Cuahtehmoc is using a sword-like obsidian toothed weapon from Aztec lore called a macuahuatil (also found in the old 2nd edition Maztica setting). We couldn't find any official 3rd edition stats on this weapon so I fudged 1d10/x2 critical. 6 pounds and slashing. If anyone knows more about this weapon or some credible 3e rules on it please comment. 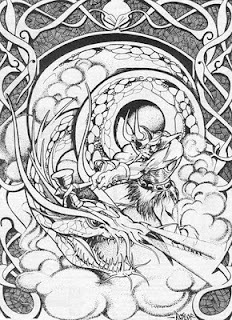 I would be remiss in my duty if I didn't chime in to pay respect to the passing of one of D&D's great old school artists, Jim Roslof. 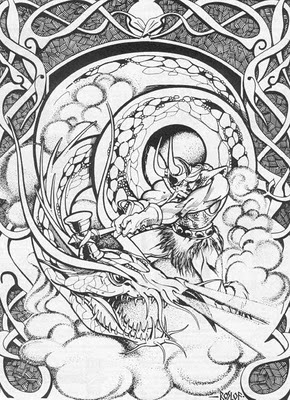 Roslof was one of those prolific illustrators that managed to capture my imagination so long ago and keep me involved in the hobby as long as I have. As an artist myself, I see his style of sinewy lined, and dyanmically posed, well-proportioned characters one that any aspiring illustrator should study and emulate. Even his most complex works like the famous full-page spread of Thor fighting the Midgard Seprent from Deities and Demigods is really just a beautifully composed yet simple piece of B&W line art when looked at closely. Truly less is more when it came to Roslof. He will be missed. For more anecdotal words about Jim Roslof, read this article at Wizards. When last we left off, Lord Hextor was on board the captured spelljammer of Mayaheine, interrogating the captain for the whereabouts of a stolen artifact and the Shield Maiden herself. What could happen next? This episode is particularly keen to me for it has a cameo by none other than my namesake, Mortellan! Mortellan of course a sage-mage-laywer from Highfolk, and sometime colleague of Maldin. The plot is certainly moving nicely and I'm looking forward to seeing more cameos in the future. "Have some gold. Me no bite hard." Some creatures that I've rarely used or even read about on this list surprise me with their level of intelligence. For example the Trapper (that monster that looks exactly like a dungeon floor) is "very" intelligent (11-12), but has no known language. It's perfectly camouflaged and it's smart as the average humanoid. Tricky! Then there is the classic Roper with "exceptional" intelligence (15-16) and its rocky cousin, the Storoper with it's mere "high" intelligence (13-14). These critters can mess up adventuring parties pretty good, but I wasn't aware they were that smart. While they also have no language mentioned, there has to be some sort of underdark-way of reasoning with these tunnel-bandits. Then there is the Crimson Death, an incorporeal undead cloud with a "genius" intelligence (17-18). I have used one of these before but never gathered that it was as crafty as your typical wizard or lich. What's more, there's a few languages on the list that I'm sure don't show up on many peoples' character sheets (except for druids perhaps), like Foo Creature, Carnivorian Apish, Hippocampian, and my favorite Moon Doggy. It's a fun list and if Zavoda missed any smart critters from the old Monster Manuals let him know. Check it out. One of Canonfire's most prolific authors, Glenn Vincent Dammerung, is back with a new series of articles on the Famous Gems and Jewels of the Flanaess. In this first installment he shows us some crown jewels belonging to the long line of decadent Overkings of the Great Kingdom of Aerdy. Stealing these gems is surely a high risk, high reward adventure! Check it out. The folks over at Dragonsfoot have been putting out top quality material for AD&D longer than I've been kicking around in the online Greyhawk community. This week I'm spotlighting a new adventure available there for free download entitled The Howling Hills. 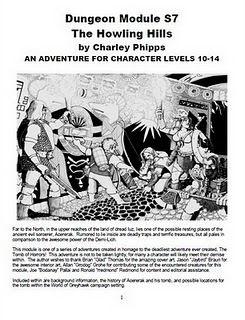 The adventure for levels 10-14, is written by Charley Phipps with cover art by Brian "Glad" Thomas. This looks to be an excellent addition to the on-going mythos of the ancient wizard-lich Acererak and his infamously horrific tombs. I highly recommend this module even for those who don't necessarily play AD&D but want to add a new twist to their land of Iuz campaign. p.s. For more of Glad's brilliant old school art go here. Lately I've been pondering the most important facet of running a Hold of the Sea Princes campaign. That's right, sailing and ship rules. There are quite a few choices at hand and I've probably used every one of them, but I am still not sure which is the best system to use. First, while I am running a 3.5 game, I'm not totally sold on all their optional rules especially for something like sailing and ship combat. Second, since ships tend to be a game within the game of D&D it should be possible to mix/match systems. This post thus is a way for me to think out things and maybe get some input in case I missed something. Expert Rules: I'd love to crack out this old book to run my seabased stuff. The rules for ships in the expert book (blue book) cover 11 types of ships, and compress movement and combat into 2 easy to references pages. No muss, no fuss. 1e DMG: This has a head-scratching 8 types of ships, and 4 pages of rules. Barely an upgrade from the expert rules, this book in true Gygaxian fashion has rules on how long it takes for a ship to burn and naval terminology. Coupled with the weather rules from the Greyhawk Glossography, this system has served well for many years. Stormwrack (3.5e): It might be unavoidable that I use this book given all the seabased spells, feats and prestige classes my friends will pick over. The ship based rules themselves cover around 12 pages and have 21 varieties of ships. There are additional entries for new shipboard weapons and gear. 2e DMG: I really don't know what happened to this book but I really can't see it being any different/better than 1st edition. Of Ships and the Sea was this edition's sourcebook for sailing but I've never owned it so I have no idea how good this system is. Dragon Magazine #116: I have to mention this issue because it rocks. It has an unparalleled article called High Seas written Margaret Foy (was she the wife of Sea Baron ruler Sencho Foy?!). I used to refer to this article once in a while for my Greyhawk games but of all the systems I've seen in D&D it is the most elaborate at 14 pages with a staggering 33 types of vessels. It's one of those articles that took Advanced D&D to a new level of simulation. Each ship entry has enough stats to literally fill out its own character sheet, such as measurements for decks, seam, draft, board, tonnage, number of masts, pumps and lifeboats. It even has a full breakdown of the crew. Combine this with the Greyhawk weather generation rules and you would have the most hyper-realistic sea campaign ever, but do I want to subject everyone to that? That's all I have access to at the moment. I'd be happy to hear about any other ship rules out there. Having reviewed all these sources I think I'm leaning toward creating a hybrid of all of these systems since as the campaign evolves over time my needs might change. More on this later. "The careful reader may notice that a single entity in the GREYHAWK campaign - be it a person, place or thing - may have several similar sounding names in different products. Folk common and learned, great and small tend to disregard linguistic precision in everyday speech. Some of the many variations in nomenclature used across the Flanaess follow. Variations like these may be used in game play by players to give more flavor to the campaign." What other game world has this kind of linguistic depth? Surely none in D&D. I can only guess that Middle Earth RPG could rightly claim enough source material to top this. "Some changes are minor, The Merchants' and Traders' Union of Greyhawk is also called the Union (or Guild) of Merchants and Traders. The Union of Moneychangers and Pawnbrokers is sometimes called the Union of Moneylenders and Pawnbrokers, as this union makes loans to guilds and individuals. The Knights of Holy Shielding are also called the Knights of the Shield or the Knights of the Holy Shielding. The Spindrift Isles are lately called the Lendore Isles, though Lendore Isle is actually inly the largest island of the cluster." How about the Union of Loansharks and Pawnshops? Too shady? Lendore Isles? Yup, that's like naming Hawaii for it's biggest isle. I still prefer the Spindrift Isles if I ever use that area at all. "The problem is worse when talking about states and peoples in singular, plural and possessive forms. Persons frm the Kingdom of Nyrond are Nyrondese, Nyrondel, Nyrondal, Nyronders, Nyrondians or Nyrondish. Persons from Onnwal (also spelled Onwal, Onwall or Onnwall) are Onnwalers, Onnwalers, Onnwalans or Onnwalish. People of the Kingdom of Sunndi are Sunnd, Sunndi, or Sunndians; those of Sterich are Sterish or Sterichers. The Oeridian tribe that founded the Kingdom of Aerdy was the Aerdi or Aerdy. Persons from Greyhawk are Greyhawkers or Greyhawk folk; those from the Duchy of Tenh are Tenha, Tenhas or Tennese. Elves from the Spindrifts are sometimes called Lendorian or Lendorese." I've often struggled with this issue when writing about Ull. The people are most often referred to as Uli, but Ulli, Ullish, Ullian, etc. could work too. The town of Kester has been particularly tricky for me. I can't decide between Kesterian, Kesterite, Kesterese, Kesterish and so on. Any thoughts? "The names of the human races are subject to many cariant spellings The Flan are also the Flannae or Flannish; the Suloise are also the Suel or Suelites; the Oeridians are also the Oerids. A few racial names change little in any form (an example: 'A Rhennee wearing Rhennee armor joined those other Rhennee and left on that Rhennee barge')." That Rhennee line cracks me up. As for my own preferences, I like to use Flannae, but Flan seems easier to write in a pinch. Suloise likewise is a fantastical word but Suel ends up the easiest choice and won't confuse anyone. It's then no surprise that Oeridian ends up playing second fiddle to Oerid because it has fewer syllables. Also: I hope i'm not the only one who gets completely dyslexic when I try to read or write the subrace, Touv/Tuov. "Certain enhancements, such as adding 'Town' after the name of a village or city (for example, Hardby Town), are not uncommon. Terms for communities (hamlet, village, town, city) are casually applied even in formal speech and writing. Safeton, Hardby and Elmshire might be called villages by those who hold them in low esteem, or cities by those who think them important. They are in fact towns." This part I think anyone can familiarize with. I live in a 'ville' but we're considered a city, but I'm sure the larger city next door would call us a town by comparison. "Some 'creative spelling' is inevitable in such a massive setting as the Flanaess - or 'Flaness,' as some write it. Keoland becomes 'Keoghland', Urnst becomes 'Ernst', and so forth. Personal names are subject to some creative spelling as well. Sevvord Redbeard, the grim Master of Stonehold, is 'Seuvord' in some sources. Lord Baron Lexnol of Ratik is 'Archbaron Lexol' to some. Ewerd Destron, the szek of Onnwal before the Greyhawk Wars, became 'Elverd'; Duke Karll of Urnst became 'Karl'; and mysterious Mage of the Vale, Jaran Krimeeah became 'Jason Krimeah' in several sources." Ah yes, the classic Jason Krimeah goof. *shakes head* I've personally used Ernst and Keoghland before. Those of course are Gygaxian homage/pun names of real people. For more on that. "Misspellings can be repeated unknowingly in later works causing careful scholars to pull out their hair. The actual name of the Lord Mayor of the City of Greyhawk, for isntance, is Nerof Gasgol, but when his last name is pronounced the 'o' sounds like an 'a' (Gasgal), and that is what everyone thinks his name is when they write it out. He has long ago given up trying to correct the error, so it remains Gasgal herein."